MOYOCK, N.C. — It’s a name that’s become synonymous with the murky world of counterinsurgency in Iraq and Afghanistan – where the subtle tones of the enemy’s colors blend in with innocents. In a war like this, no one is secure and the military has its hands full, so the American government has turned increasingly to civilian contractors who pick up the slack where military and federal security personnel left off. One of the most recognizable players in the private security industry is Blackwater Worldwide, the company founded by former SEAL Erik Prince in the mid-1990s. Though the company is best known for its burley, highly-trained security guards who are often pictured flanking State Department officials and ambassadors in Iraq or Afghanistan, there’s more to this sprawling, 7,000 acre compound here in the swampy coastal plains of North Carolina’s northeast than meets the eye. With an array of firing ranges, shoot houses, an aviation support fleet and a roster of trainers capable of delivering instruction on any kind of martial skill known to man, Blackwater has become a juggernaut in the world of private military companies. Originally founded as a training and target manufacturing company, Blackwater has launched a media offensive to shake off its reputation among critics as a “shoot-first-ask-questions-later” band of bearded mercenaries. Two high-profile incidents in Iraq propelled the normally secretive company onto America’s front pages, and the news wasn’t good. In March 2004, four Blackwater contractors were ambushed and mutilated in Fallujah, Iraq, sparking a brutal invasion of the city that was soon halted after the fragile Baghdad government balked at the public outcry. The incident sparked a furious debate over how prepared security contractors were to deal with the insurgency and added fuel to simmering resentment from traditional military forces angry that they had to come to Blackwater’s rescue only to be pulled back before the job was done. Then in September of last year, Blackwater guards securing a State Department motorcade were accused of killing as many as 20 Iraqis when they claimed their convoy came under fire in Nisoor Square in busy downtown Baghdad. Though Blackwater claims a perfect record in securing its clients, some say it comes at the cost of highly aggressive tactics and civilian bullying. 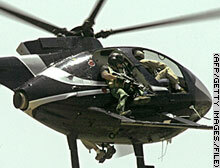 With dozens of ranges that cater to everything from long distance shooters, to demolitions technicians to super-secret “tier one” special operations forces, Blackwater is hard to beat when it comes to the sheer breadth of military tactics training a force could do here – particularly at a time when communities increasingly shun the environmental impact of military operations in their backyards. In fact, the Virginian Beach police department has a 40 year lease with Blackwater — 30 miles from the coastal city — to train its officers, since range space is so limited where they work, Jackson said. And the company’s entrepreneurialism doesn’t stop there. In a corrugated steel airplane hanger, a row of three Blackwater-designed mine-resistant ambush protected vehicles sit in various stages of assembly. The company missed the initial order for standard MRAPs after the services reduced their buy, but the company’s new MRAP II — dubbed the “Grizzly” — boasts greater protection against armor-penetrating explosively formed penetrator bombs and could be a player for future orders that meet that growing threat, Blackwater officials say. They’re even working on cooking-grease-fueled vehicles, power-generating windmills and airship surveillance drones. But, ironically, it’s Blackwater’s re-emphasis on training that’s caught the ire of lawmakers in Washington who question why the Pentagon hires out instruction critics say should be taught in the services’ own school houses. Blackwater got its first contract from the Navy after the bombing of the Cole exposed a shortfall in tactical training capacity for its sailors. After 9/11, that need increased as Sailors were called upon to board suspicious ships, defend their fleet from attackers and man defensive positions in the Persian Gulf and elsewhere. Today, Blackwater continues that training at its facility here, bussing in Sailors from Norfolk every day to practice takedowns on the company’s “ship in a box” — stacked, floating containers assembled to mimic a ship’s bridge. So far the company has trained about 130,000 sailors and says that in any one day over 5,000 students could be firing, jumping, fighting and blowing things up on a Blackwater range. Virginia Democratic Senator James Webb, a vocal critic of Blackwater and other private military companies, has asked Pentagon chief Robert Gates to study how much training civilian companies provide the DoD and to analyze whether it would be more efficient for the services to do it on their own. Gates passed the question on to Joint Chiefs chairman Adm. Mike Mullen, who’s looking into the matter. To Jackson, all this talk gets his blood boiling. In his view, Blackwater responds to the needs of its customers when all else has failed, and he sees no problem with filling in on training that the services can’t do themselves without significant investment. This entry was posted in Advanced Weaponry, Mercenaries, Perpetual War. Bookmark the permalink.